The Iran regime continues its campaign to push a moderate face for itself to news media and government officials through its lobbyists such as the National Iranian American Council and through its own media PR push as evidenced by Hassan Rouhani’s appearance on the venerable news show “60 Minutes;” his first interview with a Western news organization in over a year. The interview of the regime’s handpicked “face of the regime” took place in Tehran and comes shortly before Rouhani’s scheduled appearance before the annual general assembly session of the United Nations in New York. The interview was revealing because Rouhani continues to foist the misconception that there are factions within Iran between “moderate” and “hardline” groups and that the nuclear deal will empower these more “moderate” elements leading the heroic fight for Iran’s future. The fact that “60 Minutes” correspondent Steve Kroft falls for this deception is not entirely surprising given the ferocity of the Iran lobby’s efforts to push this fairy tale. The reality is that within the Mullah’s regime, all power vests entirely within the ruling mullahs and their top leader Ali Khamenei who is empowered by the constitution with sole authority over the judiciary, foreign policy, religion and most military and economic decision making. He assumes the Revolutionary Guard is similar to some U.S. federal agency that acts independently with its own politics when in fact the Guard serves solely to safeguard the mullah’s rule and does so not only through military muscle, but also through ownership of vast swatches of the Iranian economy, including the telecommunications industry and most heavy manufacturing. But Rohani reveals the true nature of the regime when Kroft questions him about the use of “Death to America” chants and the labeling of the U.S. as the “Great Satan” in virtually every speech made by his boss Khamenei. Rouhani claims the chant is not against the American people, but rather against the policies of the government; a subtlety that glosses over the fact that even after securing the nuclear deal, the regime still continues its traditions of death chants. 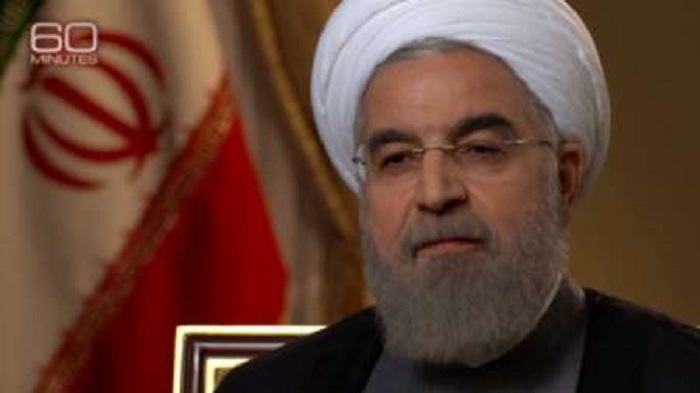 Most notably when the questioning turns to human rights abuses and Kroft raises the possibility of a prisoner exchange for the Iranian-Americans being held hostage, Rouhani is quick to point out the need for the U.S. to make the first move in a reference to Iranians being held for violations of economic sanctions in supplying nuclear components to the regime. The fact that Rouhani is suggesting a swap of nuclear arms merchants for a journalist, pastor and former Marine tells us much about the priorities of the regime. Inside of the almost fawning “60 Minutes” interview, the Washington Beacon took note of a hilarious parody ad created by director David Zucker, the man behind the films Airplane! and the Naked Gun series, in which he characterized as efforts to sell the nuclear deal as an advertisement for an erectile dysfunction medication. Zucker came up with the idea after watching the PR effort being waged by the Iran lobby’s presentation of the deal. “Every prescription drug ad follows the same basic pattern—5 seconds of how amazing and wonderful the drug would be, and then 25 seconds of all the miserable side effects,” Zucker said. The fact that the Times is offering up access to regime officials after championing passage of the nuclear agreement seems at best unsightly and at worst filled with appalling bad judgement. This comes after an incident last year in which the Times offered 13-day tours of Iran guided by Times journalist Elaine Sciolino” at the bargain rate of $6,995 per person. Among other things, it promised “excellent insights into … (the) life and accomplishments” of Ayatollah Khomeini, the ruthless extremist leader who posed as a liberator, but then imposed a fundamentalist Islamic state after taking control of that country in the late 1970s. Those tours are still active, and popular, according to Newsbusters.org. All of which demonstrates the effort to cash in on the windfall associated with passage of the nuclear deal and the enormous profits many are anticipating in doing business with the regime regardless of the consequences in supporting a blood thirsty regime fueling virtually all of the turmoil in the Middle East right now.